Cook Time: 1 hr. 45 min. Total: 2 hr. 5 min. 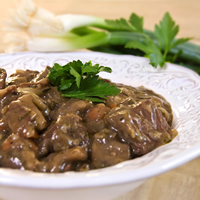 A traditional French stew full of fresh herbs, rich gravy, and tender beef. An incredible meal you can make with beef chuck and a little wine. In a large Dutch oven, heat olive oil over medium heat. Add bacon and sauté for 2 to 3 minutes until cooked. Remove bacon with a slotted spoon and set aside. Dry beef with a paper towel so it will brown better. Increase heat to medium-high and add beef to the bacon fat. Cook for 4 to 5 minutes until the outside has browned. Remove beef with a slotted spoon and set aside in a separate dish. Return heat to medium. Sauté carrots, garlic, onions, parsley thyme and bay leaves for 2 to 3 minutes. Remove with a slotted spoon and set aside in a separate dish. Add pearl onions and mushroom to Dutch oven and sauté until onions begin to brown and mushrooms become tender. Remove with a slotted spoon and set aside in the reserved bacon dish. Add beef back to the pot and dust with one tablespoon of flour. Toss to coat and sprinkle with salt and pepper. Place in the preheated oven for 4 to 5 minutes. This will add a nice coating to the beef. Remove pot from the oven and place back on the stove top. Add red wine and deglaze the pan. Pour in beef broth and bring to a simmer over medium heat. Add carrot, onion, and spice mixture to the pot, reduce heat and simmer covered for one hour. After one hour add pearl onions, mushrooms and bacon to the pot. Continue to simmer until beef is tender, about an additional 30 minutes. With a slotted spoon remove solids and set aside. Increase heat and bring sauce to a rapid boil. In a small bowl mix together remaining tablespoon of flour with two tablespoons of sauce. Stir until smooth and no lumps remain. Add mixture to the pot and stir constantly until sauce thickens. Remove bay leaves and thyme sprigs, discard. Add solids back to the pot and stir to coat evenly. Serve warm over a bed of egg noodles or rice.